Body Transformation: Muscle Gore-ging Mutation! Several failed transformation attempts didn't sideline Kevin permanently. 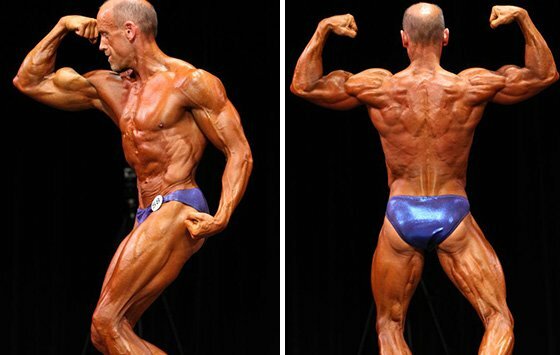 See how he shed 15 percent body fat and 77 pounds to dominate competitions at age 47! I was athletic in high school and during my time in the Navy. As I aged, life got in the way and exercise and nutrition fell down my priority list, but I had continued interest in bodybuilding and followed the lifestyle in fitness magazines. I imagined what it would be like to have ripped muscle with low enough body fat that people would look at me and know I was a bodybuilder. In 2008, I started a job that allowed me to dedicate time to train. I ate better with lots of protein, but didn't devote myself to dieting as much as training. As a result, my physique wasn't what it should've been. I had lots to learn about nutrition. My family supported my decision to get healthy again and my sons thought my growing muscles were cool. In early 2010, I injured my right biceps and took two months off from the gym. I thought it would be smart to do a fad diet during my injury so I didn't gain weight and lost muscle as a result. A few months later, I started another job and it was difficult to focus on the gym and dieting. 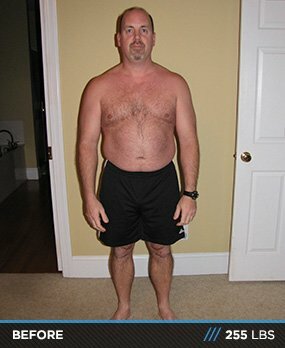 I regressed and became unhappy with my appearance and health, so I joined Gold's Gym and entered a transformation challenge without a solid plan. My plan was to eat healthier with less junk food. It didn't work and I gave up competing in the challenge. My weight training got back on track at Gold's Gym and I noticed a few people there who competed and looked vastly different from most. They interested me and I wondered if I was capable of the same goals. In 2012, I heard about the $100K Transformation Challenge on Bodybuilding.com and decided to enter with a solid plan. Before entering, I sat down with my family and told them I needed support because eating habits are hard to break. I didn't expect them to eat the same as me and they happily agreed and gave me their full support and encouragement. I scoured the Internet, joined BodySpace, and searched through articles on Bodybuilding.com. I recognized Chris Aceto and ordered three of his books, most importantly, Everything You Need to Know About Fat Loss. It was an easy read that explained the science behind nutrition in layman's terms. I found a format for a basic weekly meal plan on Bodybuilding.com and used it to chart my meal plans. After a few weeks, I made solid improvements and told my wife I was considered entering a local bodybuilding competition as incentive to stick with the plan and she was for it. I found a show one month after the end of the transformation challenge. I needed to lose more body fat after the challenge before competition, but having the commitment in place kept me focused. My goal was to look like I belonged on stage. I struggled with food cravings which seemed insatiable. The fact that family, friends, coworkers, and strangers recognized my changes kept me going. People wanted to know why I lost weight, how I did it, and if I could help them. I become a role model for others who looked for inspiration. The change in perception that I could help others achieve fitness and health goals became my motivation to finish what I started. I had many cheat meals and a few cheat days, but not too many because I was watched and admired by others. I didn't want to disappoint. I completed the Dymatize $100K Transformation Challenge after 84 days and lost 35 pounds and 15.3 percent body fat to finish at 7 percent. I continued my diet and training and competed for the first time at the 2013 NPC Palmetto Classic in Columbia, South Carolina, and came in at 4.6 percent body fat. I took third place in the novice category and won the masters over 40 category. I was shocked when the judges said I was one of the most shredded competitors on stage. I focused solely to lose weight and lean out for 16 weeks and it paid off. A few weeks later, I received a major surprise when I was announced as the first place winner in the lean category for the 2013 Dymatize $100K Transformation Challenge. At age 47, it was more than I ever hoped for. I was selected as the person who made the biggest change. I owe a debt of gratitude to everyone who had faith in me and kept me motivated. I feel obligated to help others however I can. I understand their struggles. Because of my story they believe it's possible. I drink at least a gallon of water per day and drank up to three gallons per day at some points. I train six days per week as early as possible. Working out at 5 a.m. isn't the greatest, but it allows me to train while my family sleeps so I can focus on them in the evening. I do cardio for 30-45 minutes on an empty stomach then lift for 45 minutes. As progress became more challenging (5-6 weeks out for competition), I added another 30-minute cardio session in the afternoon or evening. Dieting is everything. I haven't changed my training much during the past five years, but I lost nearly 35 pounds and more than 15 percent body fat in 84 days by eating right. I had cravings, but let my brain control my hands and mouth. I ate to satisfy my goals, not my cravings. I don't keep track of fat or calories. Calories are based on my macros, so I adjust as needed. You have to stay flexible. It's okay to cycle carbs or eat a cheat meal. I want to help as many people as possible to achieve a healthier life. I uploaded meal plans to my BodyBlog and worked with numerous people on a personal level. When you start out, you need encouragement and guidance from someone who's knowledgeable. I need to figure out if I'm better off in bodybuilding or men's physique. I'm not very big and need to add muscle mass to hang with the younger competitors. That's my short-term goal. I plan to enter the SC State Competition next June and compete in master's bodybuilding. That means I'll compete against 35 year olds when I will be 48. That's a challenge. I may enter the Big Shott Classic on October 5, 2013 in the masters over 35 men's physique and bodybuilding. You're never alone on your journey. Reach out to others who accomplished what you hope to and ask for advice. I failed at this in several previous attempts before getting it right. Get your family on board and ask for support. Commit mentally and then physically. The mind is the strongest tool you have. It can overcome any obstacle. Nobody can maintain an absolutely strict diet forever, so give yourself minor allowances to keep your sanity. Plan ahead and have healthy meals ready to go. I used Bodybuilding.com as a resource for every aspect of my transformation. I adopted my meal plan format from an article on the site and found information from Chris Aceto's suggestions that led me to his books. I relied on personal friendships and social circles in BodySpace to motivate and encourage me. Seeing the transformations made me believe that I could do this as long as I had the mental fortitude to stick with the plan.